Today at noon CST Flourishes posted a sketch challenge. Here is the sketch. It’s one where — if you play along — you could win Flourishes entire release for July! Pretty exciting, right? So, let’s get to the action! HOW TO PLAY: See this sketch above? All you need to do is make a card or creation by using this as your inspiration and you’ll be in the running! It’s just that easy! With four stamp sets on the line, what are you waiting for? Here is my card using the new Honeycomb background. This is an amazing stamp. Marcella actually watercolored this image and we made a stamp from the image. It stamps beautifully. On my card I stamped onto So Saffron paper and Memento ink in Daffodil. For the smaller image I used Flourishes Classic Ivory paper and the same Memento ink and got a was able to infer a both positive and negative image. The small image was stamped in Memento Black and colored with Copics. Spellbinder dies Oval and scallop ovals really set this image off. A bit of May Arts Ruffled edge ribbon and Vintage brad just set it off. This card is for Mike, “the shipping guy” aka my dh. He is off in Europe visiting with children and grandchildren and this will be part of the welcome home package. You must have a link to our challenge in your blog or gallery post. Need a little inspiration? Check out these fine ladies creations to get those creative juices flowing! 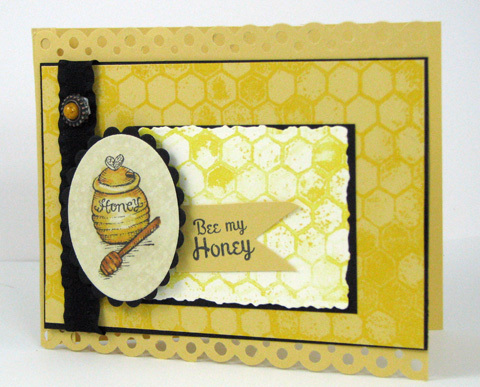 All of our sketch designers are showing off our new set Bee My Honey! Don’t forget to make your challenge entry count by linking up below using our Inklinkz Widget! Link your creation on the Flourishes Blog. Old song! !…great choice of papers and what a cute set this is. The cuteness of this stamp set just keeps adding up. The little honey pot & honeycomb background are just perfect together. Oh this is beautiful Jan Maire. I love the honeycomb background. I added you to the link list on my blog. Sorry I didn’t have it on there yesterday. Oooo I love the honeycomb image….so fun in making bg paper for the sweet images!!! Love this card- the colors and stamps are great! Love the layering of two honeycomb panels! Sweet!